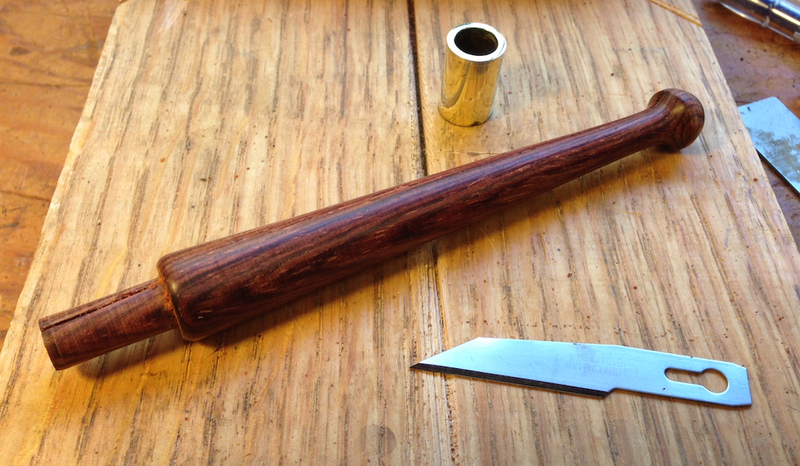 While the turkey was cooking yesterday I turned another marking knife handle, this one out of Cocobolo. It all came together fairly nicely, I was really gentle with the turning, and the wood was much stronger than the Walnut burl — much more appropriate for this application. I’ll glue this up today and see how it works. 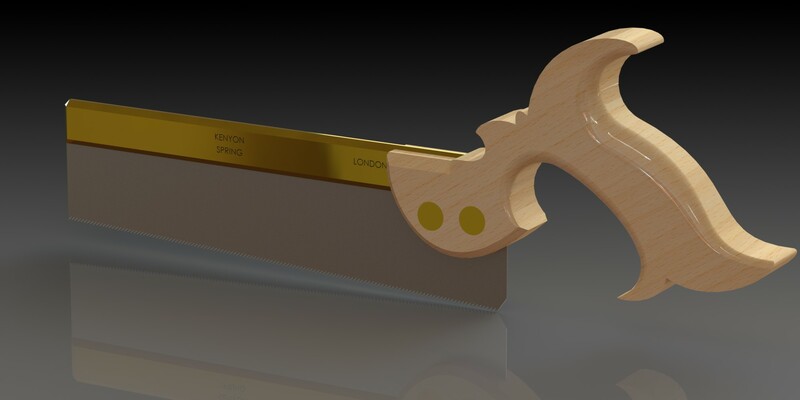 I polished the brass collar and sawed the slot for the blade. 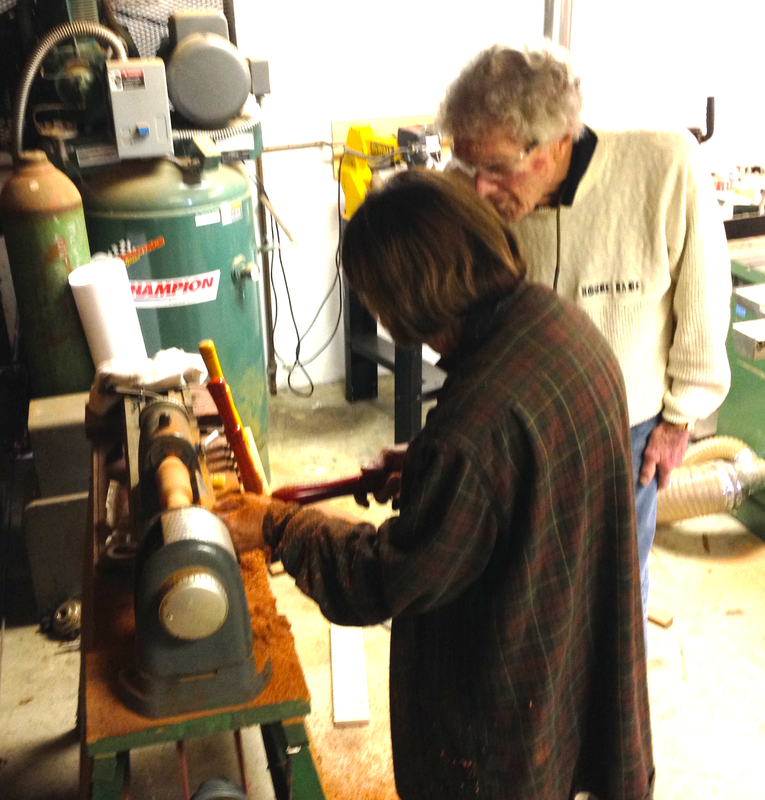 I used an old gents saw that I had, to try to get the finest kerf. That was a mistake because I know it’s impossible to saw straight with it. Next time I’ll use my dovetail saw. I had a good couple of hours in the shop yesterday and nearly finished the seat assembly for the Chevalet. In my previous post I was on the fence about whether to use hand or poser tools for the joinery. This is not a philosophical debate for me, it’s more about pragmatics. What approach is going to get the job done most efficiently with the best result? 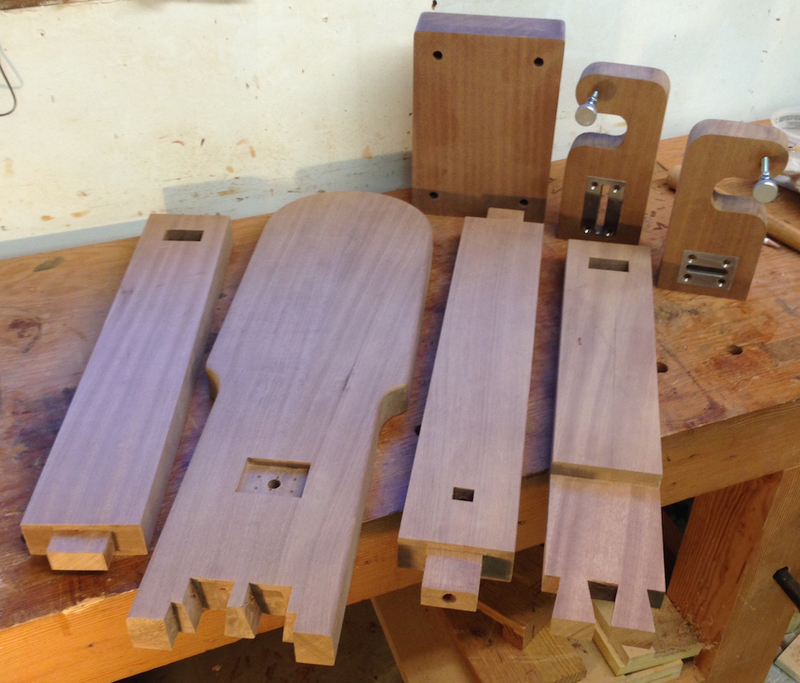 For example, on tenons I’ve done bunches of them using a dado stack on my table saw with the tenon face horizontal. The fence controls the height of the tenon and the blade height controls the depth. 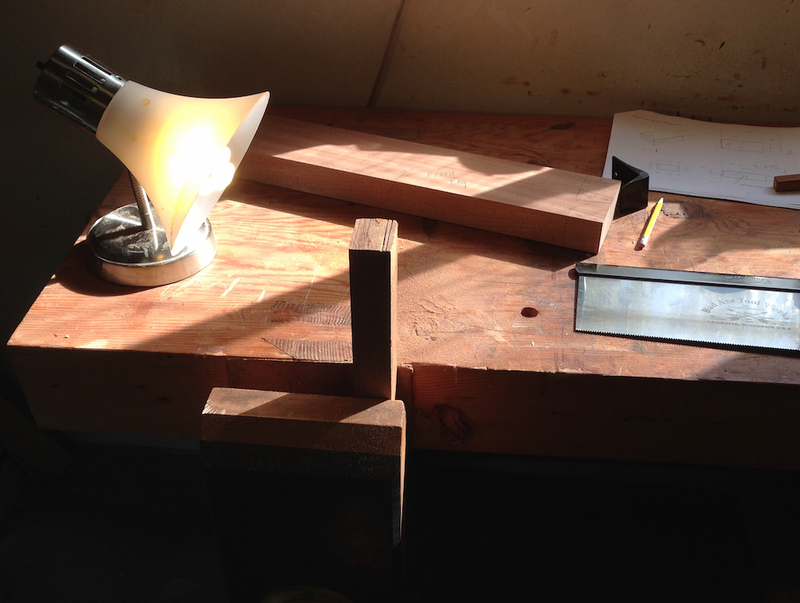 With a bit of scrap wood I can dial the tenons in to a very precise measurement. 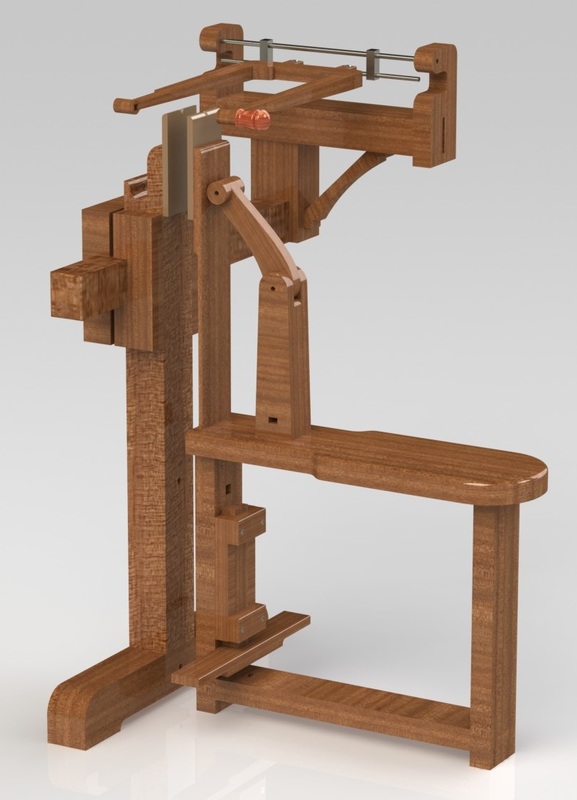 The downside is that I have to change over to the dado set and set up for each unique tenon face. So I decided to use as many hand tools as I could yesterday. First the mortises, I had two blind mortises and two through mortises to do. They are large enough that I didn’t want to try to chop them alone, so I drilled out the bulk of the waste and pared the remaining material in little bits until I got to the wall. For mortises up to probably 1/2″ wide I’d probably have just chopped them directly, but the smallest of these was 1″ wide. 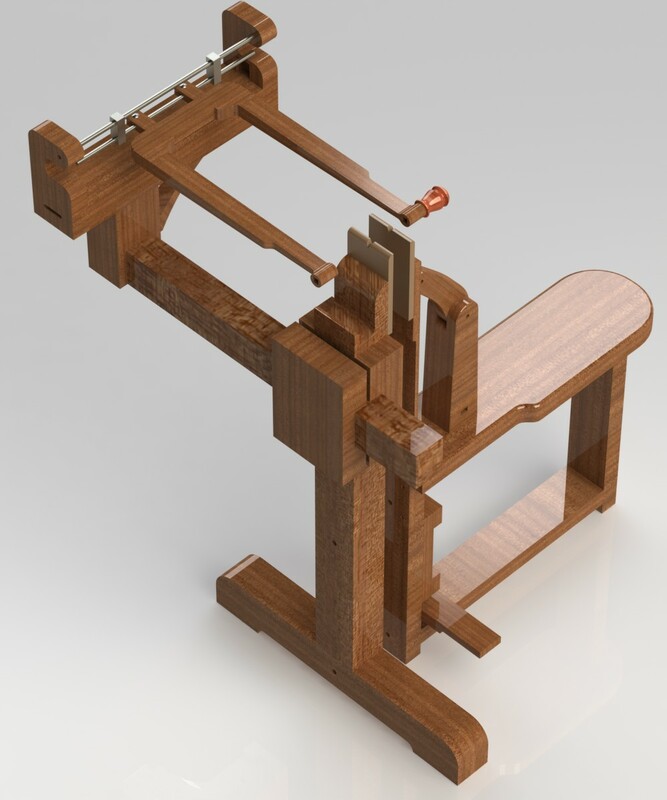 This is the blind mortise for the toggle arm that actuates the clamp. The clamp assembly is bolted from below. 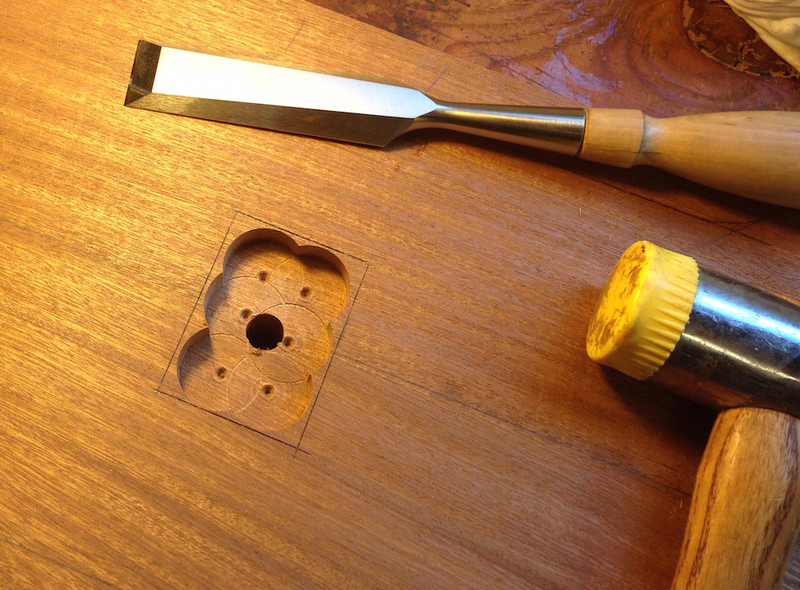 I used a 1″ bit to clear most of the material, being careful to hit the same depth each time. 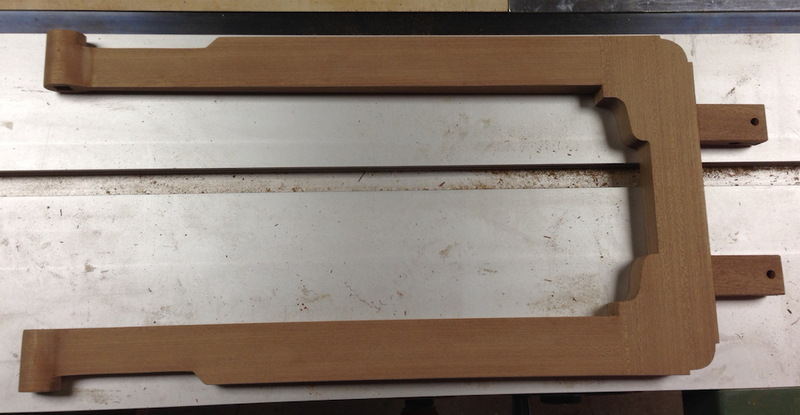 After paring the waste back to 1/16″ or less from the walls I set the chisel in the knife lines and chopped straight down. 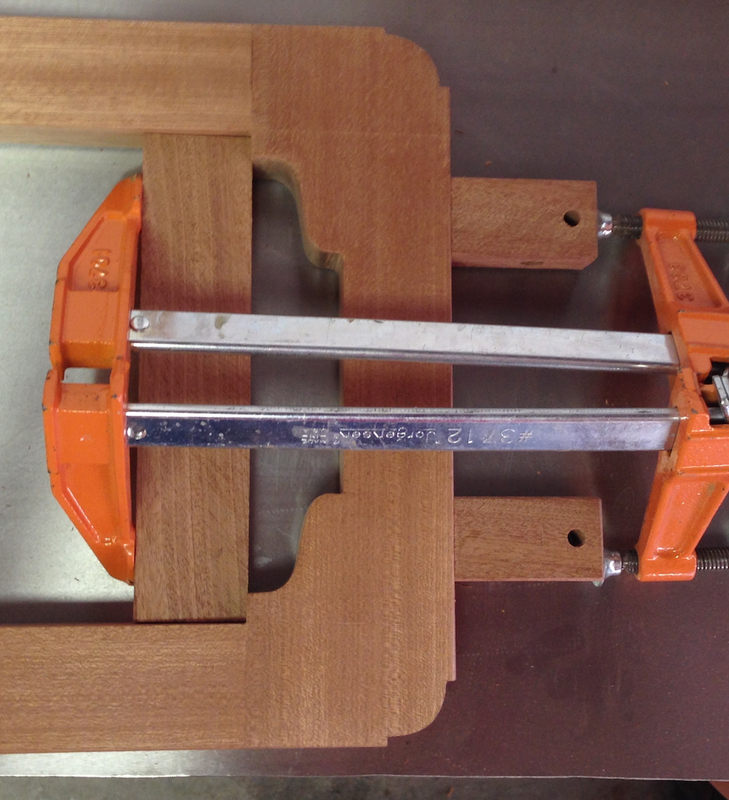 I’m really pleased with the results, it took very little time and didn’t require any special jigs or tools. I know there was a stage where I would have done this by making a jig and using a router, which would have been time consuming and noisy. And I’d still have to square the corners. 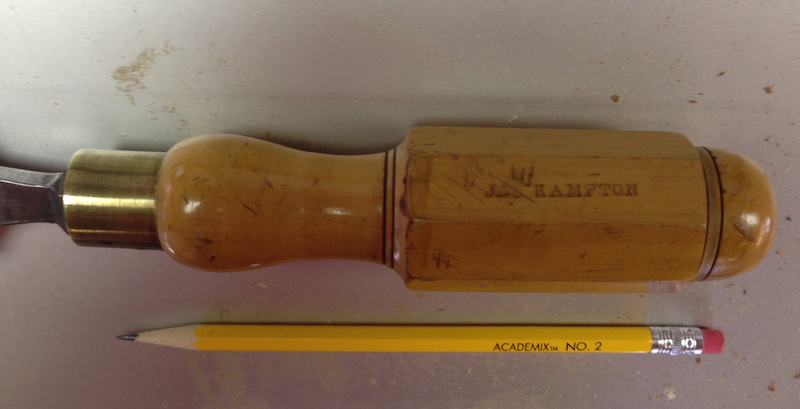 Nice looking mortise, if I say so myself! 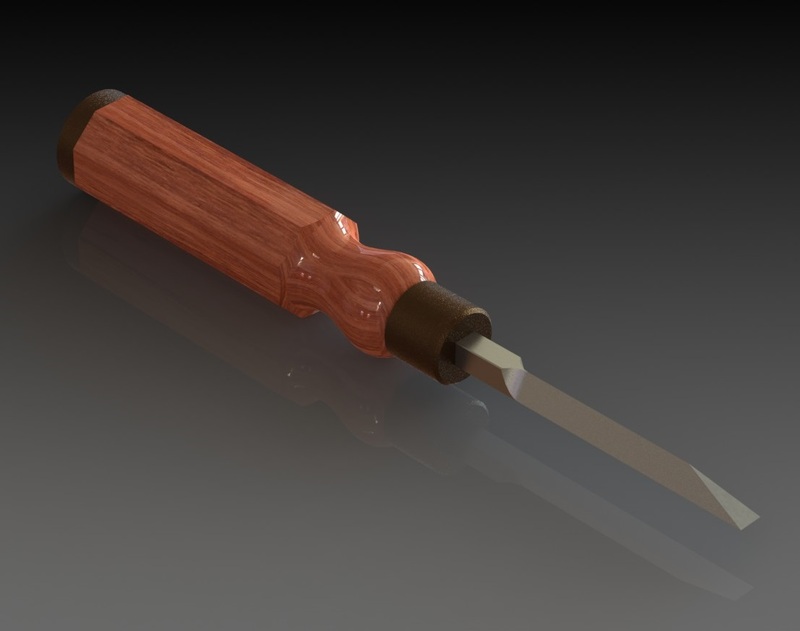 What makes this work for me is taking small bites with the chisel, and having the work oriented so I’m always looking at the side of the chisel to ensure it’s plumb. 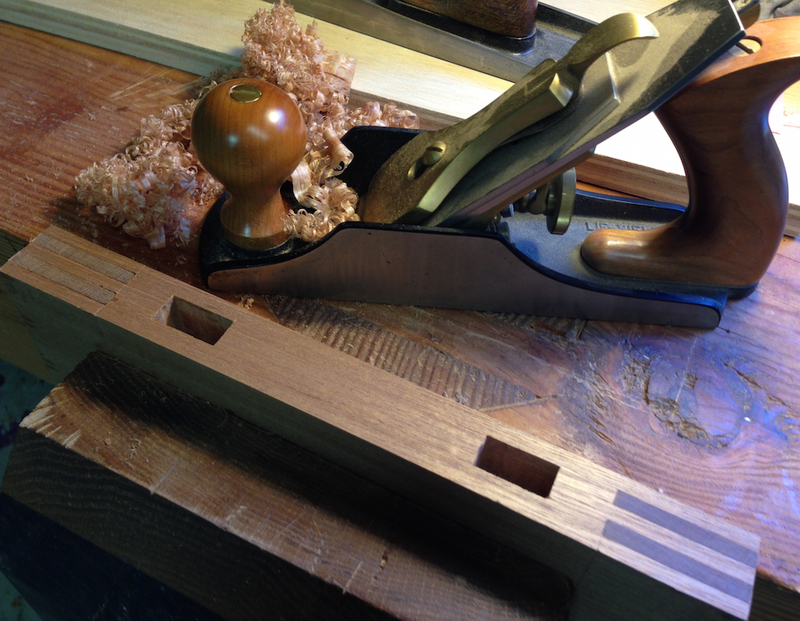 I work my way around the mortise nibbling away until I’m about 1/32″ to 1/16″ from my knife lines everywhere. 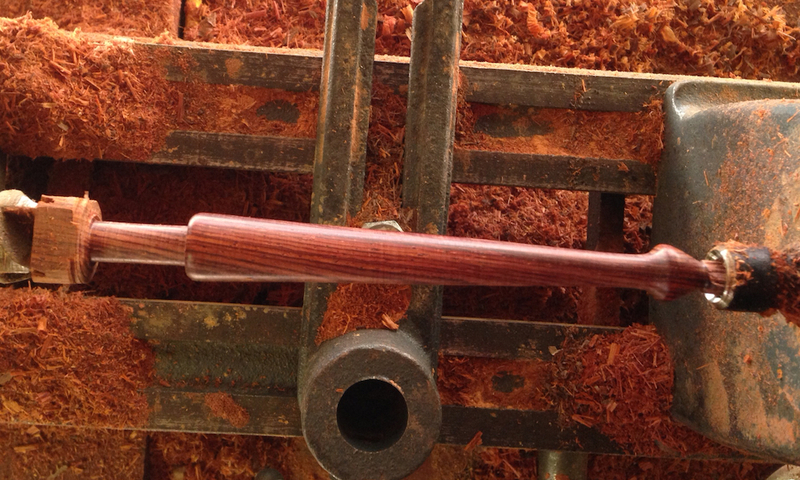 Taking small cuts is more controllable and easier to keep the chisel vertical. I never let the walls get out of control. Small cuts are the key, this is typical of what I’m pulling off the walls. On the through mortises I followed the same approach. I knifed in the layout on both sides as accurately as I could, drilled though to remove the waste, and pared back to the line evenly before cutting directly on the knife line. The only difference was that I worked from both sides towards the middle of the board. I got one side to within 1/32 of the line, flipped it over and did the same on the reverse. 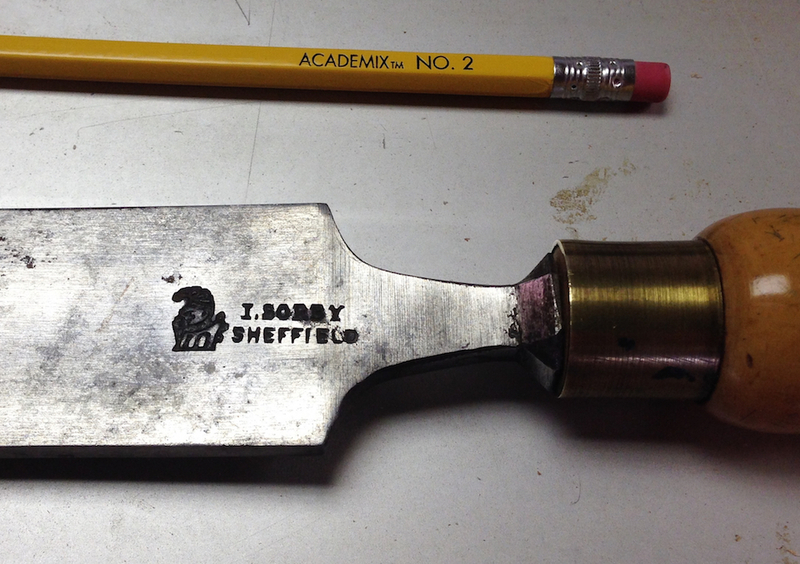 Finally I dropped the chisel in the knife line and finished it from both sides. There is a tiny bit of unevenness in the middle (the board is 1.75″ thick), but it’s tiny and won’t affect the fit or strength in any significant way. Again, happy, happy. 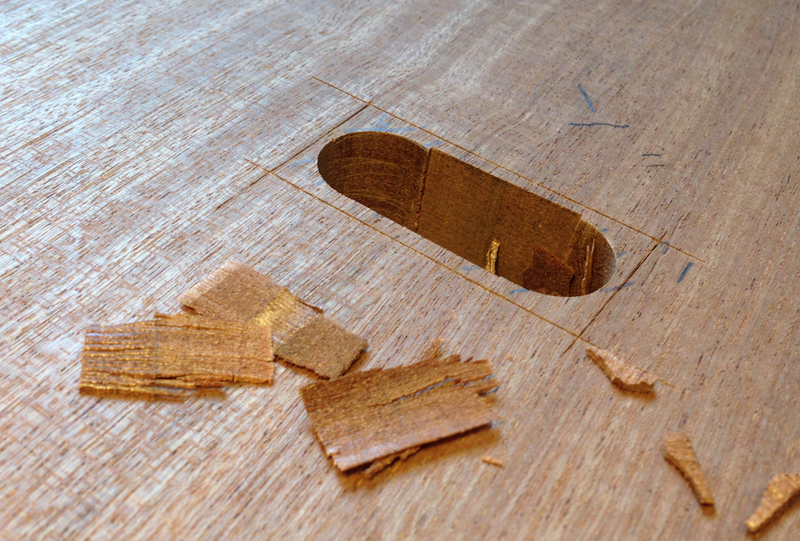 I mentioned yesterday that there was a problem with the big dovetail joint not reaching the surface of the seat. Sure enough, when I measured the seat blank I discovered that I’d left it over-thick. It was supposed to be 1.75″, but I’d left it at something like 1.860″. Before I could thickness it to correct that I had to finish with my layout lines on the top, so I cut out the profile, rough cutting it on the bandsaw and finishing the radius with my spokeshave. 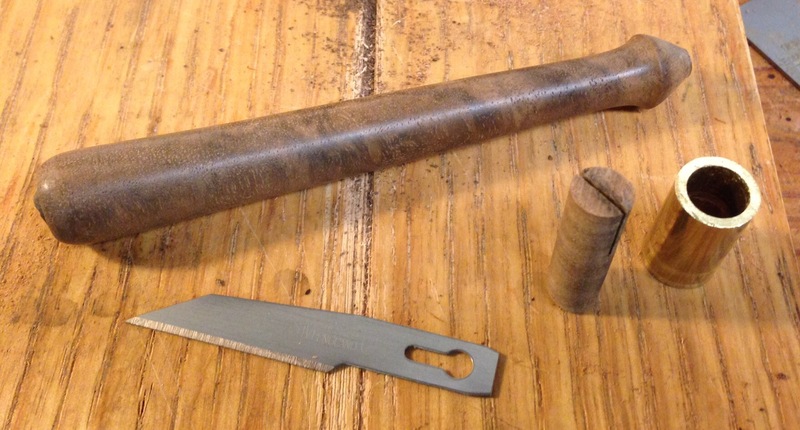 I used a rasp and scraper on the front transition sections. Seat base shaped, the top edge will get a generous round over later. 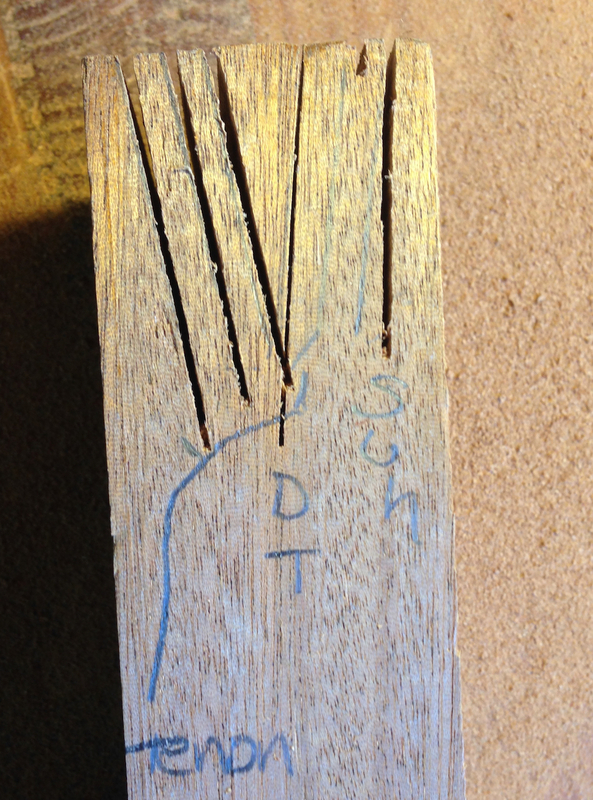 The gist of “re-tensioning” is to tap the saw plate a tiny bit further into the folded back at both the heel and toe. Honestly, any problem I can solve by whacking it with a great huge hammer, I’m all for. So two taps of the hammer later and my tenon saw is magically healed. Who knew? 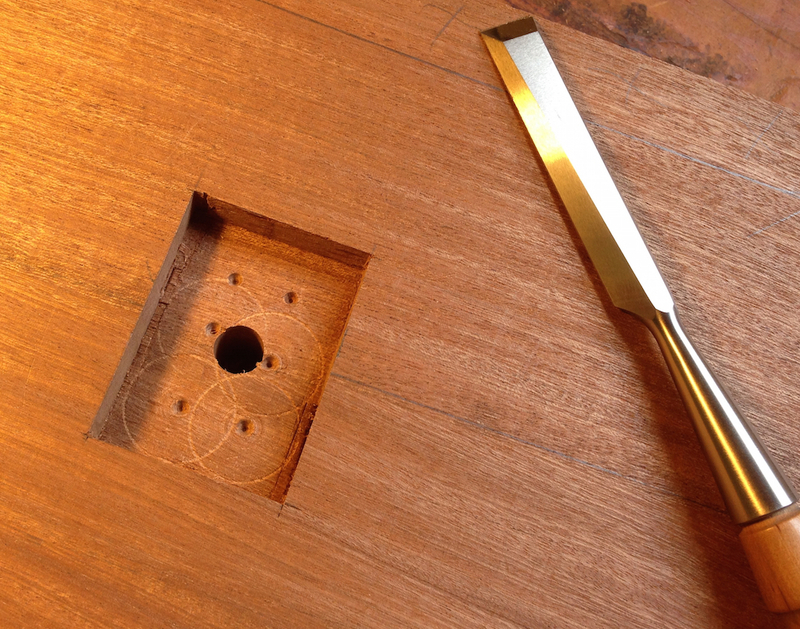 So I laid out the first tenon, that goes into the seat bottom and checked it against the mortise. 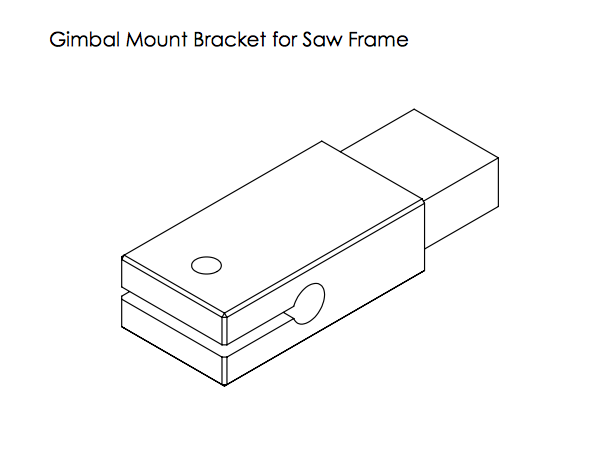 Thank God, because I mad my mortise gauge set to the wrong dimension. 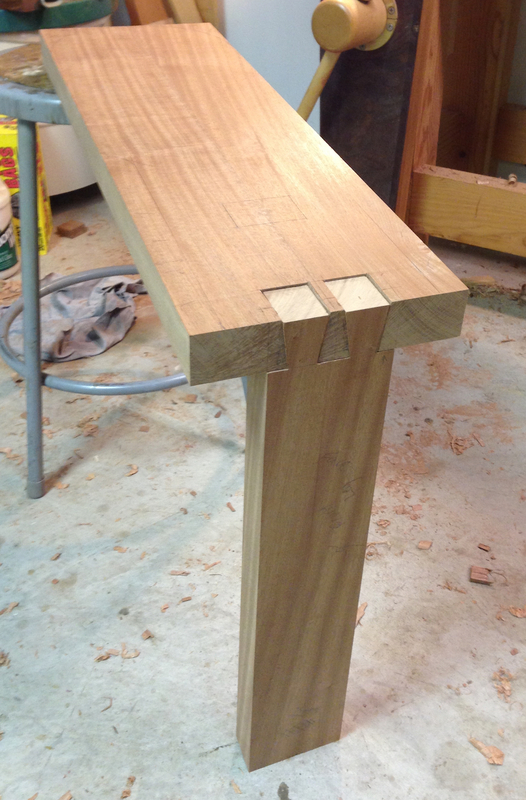 Take two; I laid out the tenon. Again. 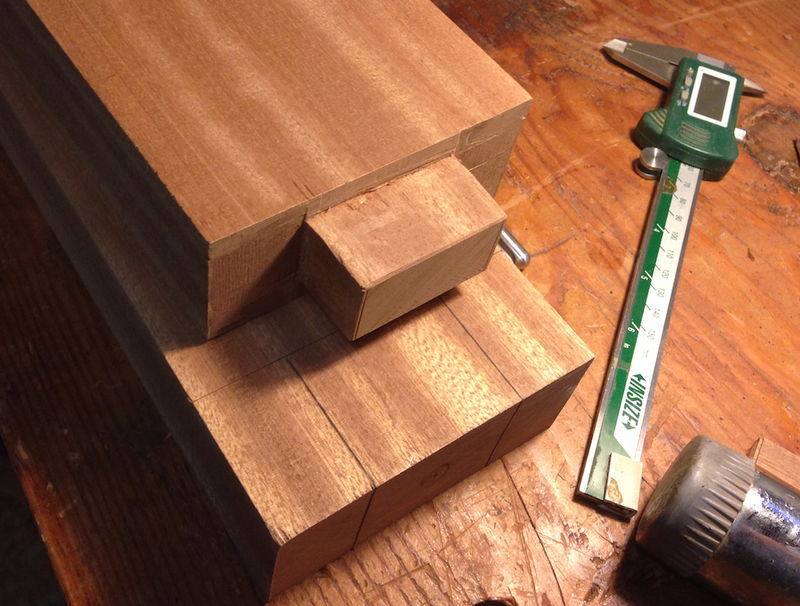 I sawed the tenon down to the shoulder lines. I think the tenon saw is a little coarse for shat I’m doing, or maybe I’m just not used to it. I need a bigger handle too (or smaller hands), this one pinches my hands. 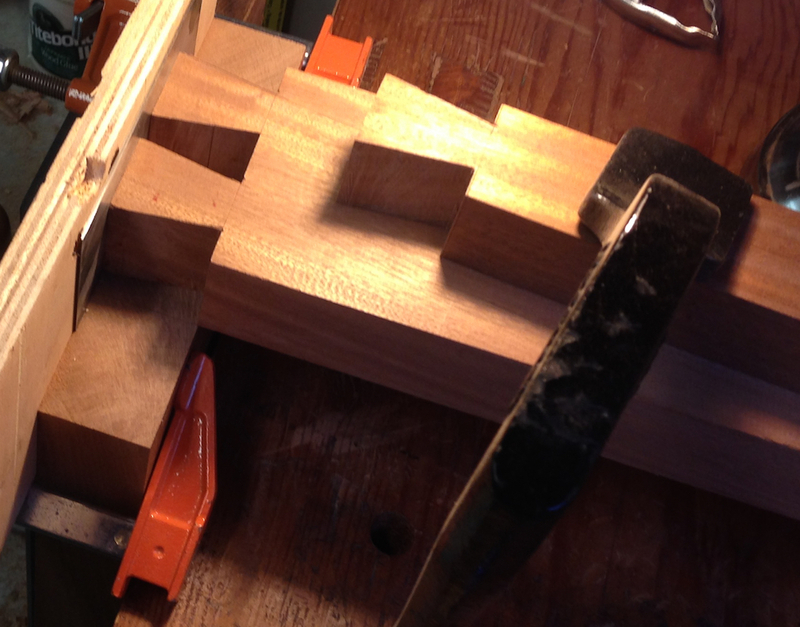 On one of the tenon edges I angled waaaaay off the mark, likely it was into the waste. 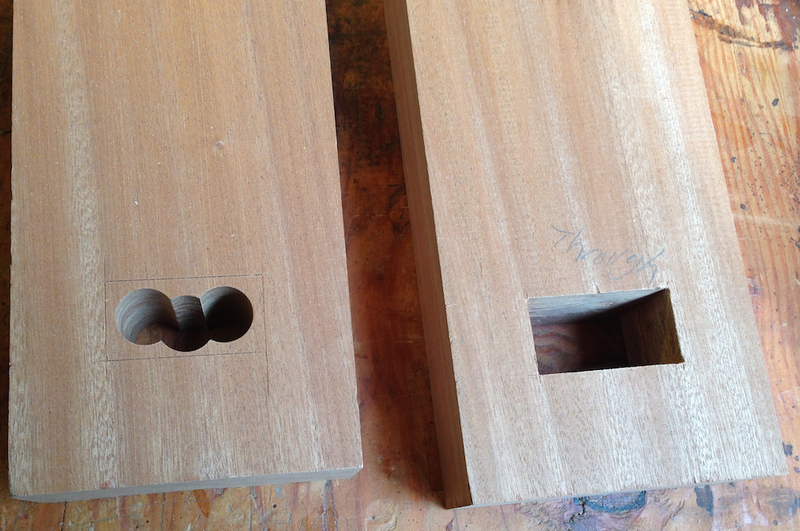 I pared the mistake away and then planed the tenon faces to fit. 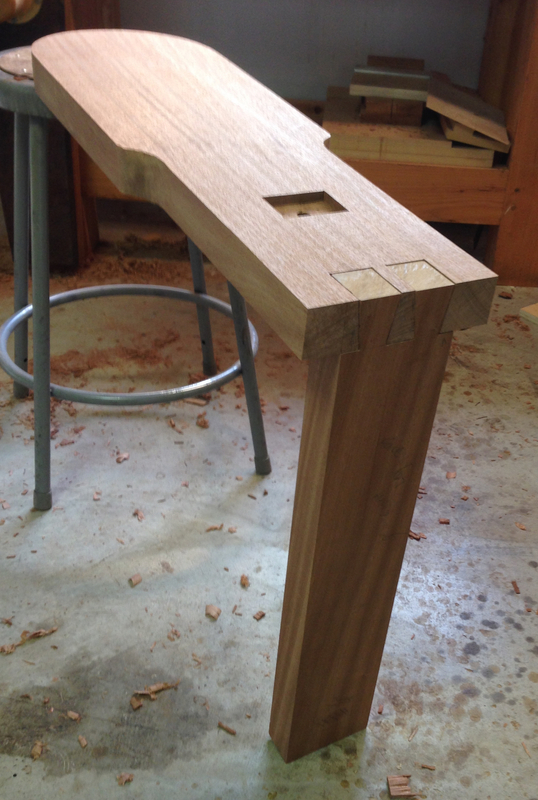 I intentionally cut the tenon oversize to give myself room to screw up. I sawed the shoulders on my knife line without cutting a “V” like I usually do, and was left with a whisper of excess all around that I could chisel away, I ended up with a snug fit and a decent shoulder in the one place on the project that no one will ever see! Two more tenons and a couple of holes to go and the seat will be done. 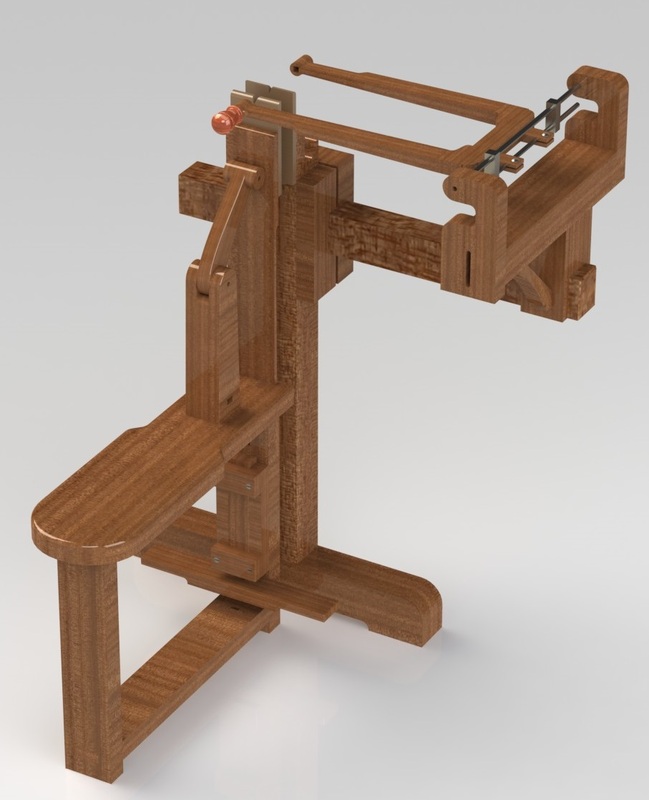 I’d better start on the CAD layout for the toggle arm and foot clamp mechanism. 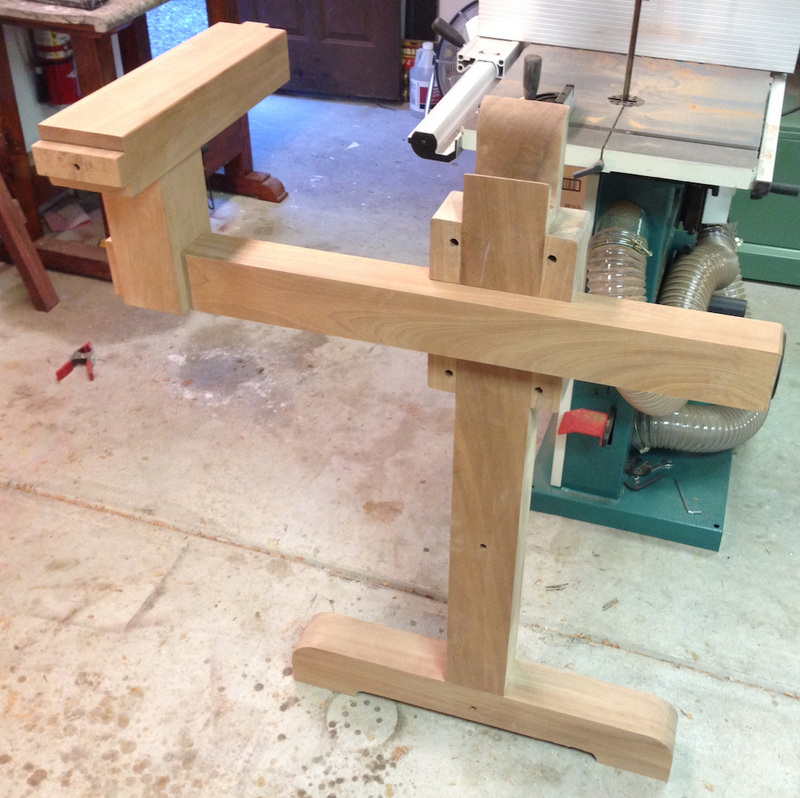 One tenon done, two to go.